We are working with Efficiency Maine to provide qualified Small Businesses on Mount Desert Island the opportunity to upgrade to new LED lighting at a significantly reduced cost. If you’re a “Small General Service” (SGS) electric customer in an eligible town, Efficiency Maine will pay 75% of the total upgrade cost for new LED lighting at your business. Projects are designed to significantly improve quality of light, reduce lighting maintenance costs, and past participants are saving approximately $100/month or more. Step One: Fill out this online form. Step Two: A local electrician will follow up to schedule your free, no-obligation lighting assessment. Step Three: After the assessment, you and your contractor will review the proposed project scope for your approval. You’re now ready for the contractor to order and install your new lighting. For most small businesses, your cost will be 25% of the total project cost with Efficiency Maine paying the contractor the remaining 75%. Most businesses recoup their upfront cost within the first year or so in lighting savings. 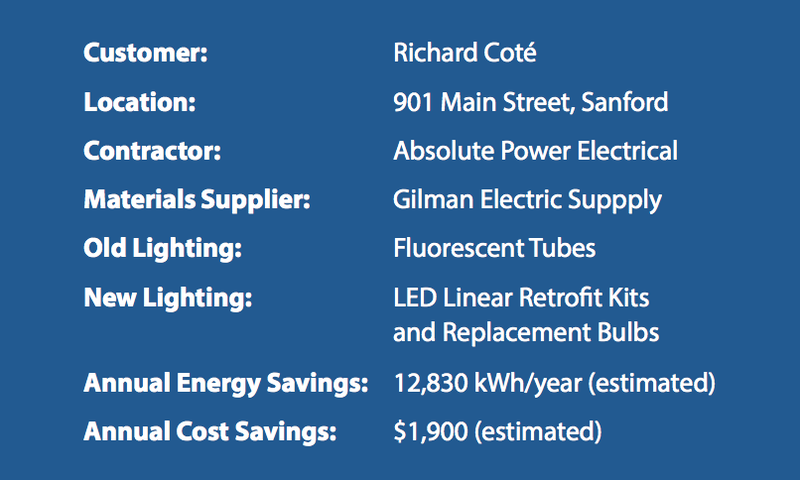 Enjoy lighting savings, better quality of light, reduced lighting maintenance costs, and reduce your carbon footprint! Questions? Contact Haley at haley@aclimatetothrive.org. Sanford's oldest hardware store now has the newest, most efficient lighting. 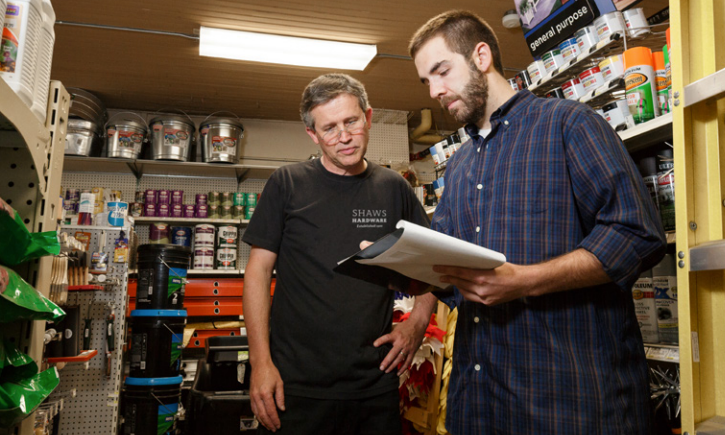 Thanks to Efficiency Maine’s Small Business Initiative, Shaw’s Hardware will save nearly $2,000 per year on lighting costs, and a lot of time replacing bulbs. A local contractor, Absolute Power, assessed the existing fluorescent lighting, provided estimated project costs and savings, and installed LED lighting throughout the retail floor and back room. For more examples of how Efficiency Maine’s Small Business Initiative has helped businesses from around the state save energy, check out these case studies. Sign up with your email address to receive a monthly newsletter and one update per month. We respect your privacy. Opt out at anytime.